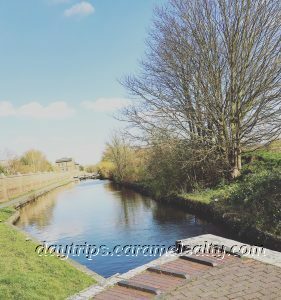 The  Grand Union Canal is a 137 mile liquid motorway that connects London to Birmingham. It is no plain sailing, for it has in total, 166 locks from start to finish. But judging from my walk below, it is a far more delightful way of arriving in Birmingham than the monotonous M6! So here’s a quick recap of my day so far. 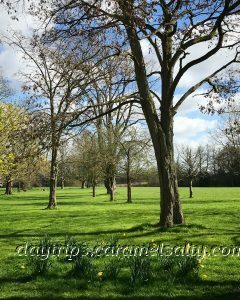 I spend the morning exploring the grand rooms and spacious gardens at  Osterley House. 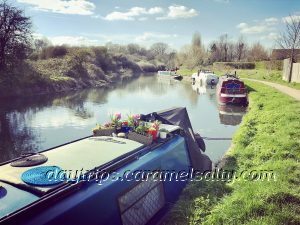 After a quick lunch, I embark on my circular walk which takes in the Grand Union Canal. Within 30 minutes from Osterley House, I’ve switched from wandering around a grand estate to walking in an urban, industrial scene. My walk now takes me past security fences, breeze block walls, a railway line, an industrial park, skips and yards full of timber and metal scraps. 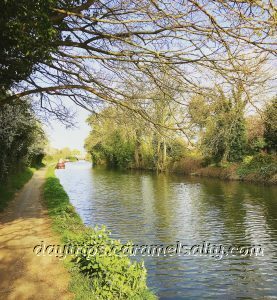 Until I get to the Grand Union Canal, the start of the second part of my walk. I’m in the district of Ealing in London. So other than pretty potted plants on the roof of barges, I’m expecting a very suburban walk. But almost immediately I come across  Piggeries Orchard, a voluntary scheme that plants fruit trees for passers by to help themselves to. What a wonderful idea!! 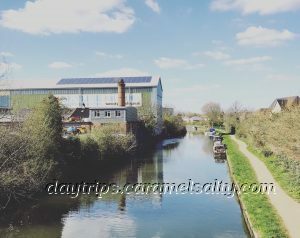 The Grand Union Canal was first built by William Jessop at the end of the 18th century to provide a speedier trading route from the Midlands to London. Tall signposts on the tow path countdown the miles to Birmingham. 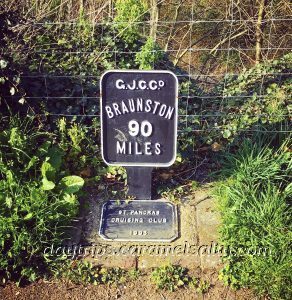 At canal level though, I find mile stones for a town called Braunston. So other than the 1,759 villagers of Braunston, why is Braunston of interest to the world? It’s because of the width of this canal. Every lock from Brent to Braunston is able to accommodate two narrow boats abreast of each other. So this is actually the quick bit of the journey!! From his canal side lodgings, it was the job of the lock keeper to manage the locks. It wasn’t a solitary existence. All around him would have been a community of carpenters and bricklayers, some living on boats along the canal. They are all the essential workforce to keep the locks in working order. Raising a family of 4 or 5 on a narrow boat would have certainly been a very cramped affair. 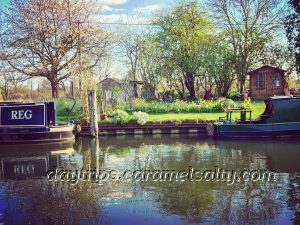 Communities still live in barges along the Grand Union Canal. Some have their own little private garden on land. Some gardens are tended beautifully. Some have practical items, like a shed. In one garden, I spy a child’s trampoline. I can imagine the scenes at these locks during the heydays of the canal, when thousands of boats traveled along it. 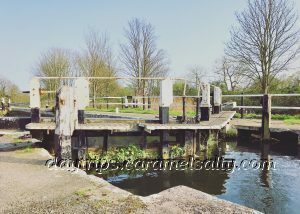 From the crack of dawn, a queue of boatmen would start forming at either end of these locks. It was the lock keeper’s job to manage fraying tempers as they waited their turn. Time and tide waits for no man. And that is certainly true with the tidal section of the canal downstream of Brentford Locks. Which is why I’m sure there must have been some heated exchanges as boatmen jostled to get their turn in the lock. 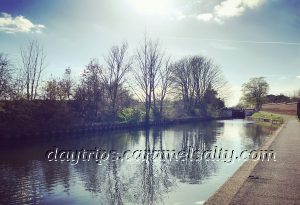 Whilst I stand at the bottom of  Hanwell Locks, admiring the flight of locks ahead of me, a breathless boater runs past. He has just tackled the first of these ancient locks. “How many more ?”, I ask. “Just six more” , he says. 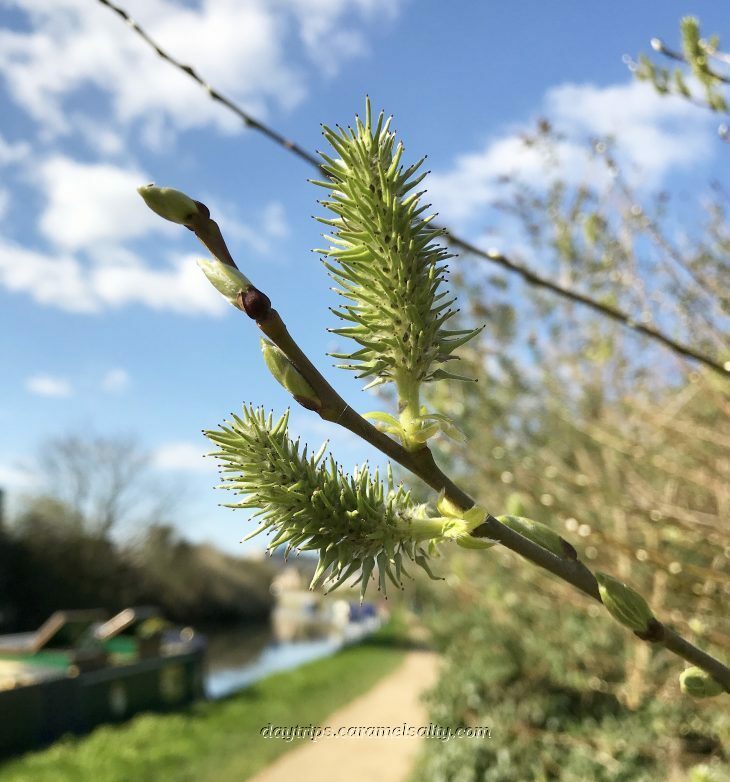 I wave bon voyage, as I set off on foot along the old tow path. 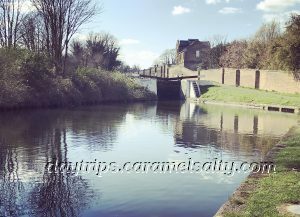 The series of locks at Hanwell date back to 1794. Today it is a Scheduled Ancient Monument. 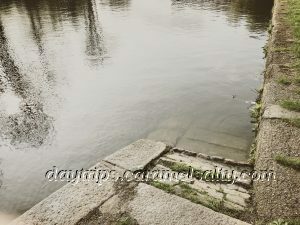 My legs can certainly vouch for the fact that these locks raise the water level by a hefty 53 feet in just half a mile. No wonder horses occasionally fall into them as they towed heavy loads up the sometimes slippery incline. It all looks very Dickensian as I walk along the tall, grim brick wall at the back of  Ealing Hospital. It used to be an asylum where the inmates gardened in its huge allotment for fresh air and exercise. Excess vegetables were then traded for coal, shipped in through the now bricked up archway, into what the boaters called  Asylum Docks. 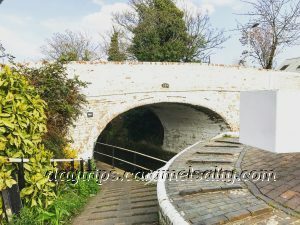 When I started my walk along the canal, it was actually along an engineered part of the River Brent. The river veers off near  Green Lane. There is also a sign for the very convivial looking  The Fox at Green Lane. Perfect for a pit stop. 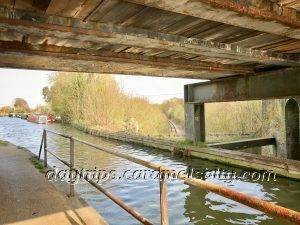 When the great engineer Isambard Kingdom Brunel is asked to build a railway to Southall, he runs it underneath this canal at  Three Bridges. 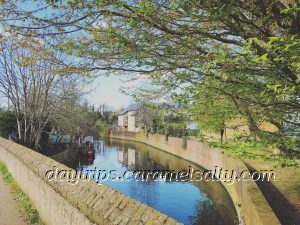 A traffic road, Windmill Lane, also runs over the canal at the same point. This is a very unique bridge, where three modes of transport intersect each other. 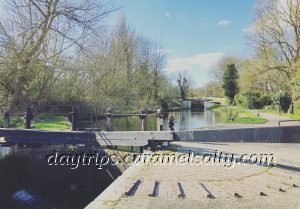 Officially, Hanwell Locks comprises 6 locks. But by the time I get off the canal at the pedestrianised  White Bridge I’ve counted over 12. I think of that boater from before. I think he’s got his work cut out for him. And I do hope he is not in a hurry. 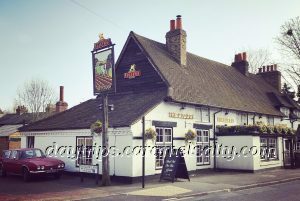 The walk through the suburbs of Ealing after White Bridge is not worth talking about, until I get to the Grade II  Plough Inn. I go down  Tentelow Lane and across a wide open field, which I’m sure was part of the 750 acre Osterley estate in Tudor times. Crossing over the M4 I’m back at Osterley House where I started this morning. As I leave, I pop into  Osterley Farm Shop for a wide selection of locally sourced vegetables. And with a full shopping bag, this ends one of my more enjoyable walks from my little AA book of London walks. 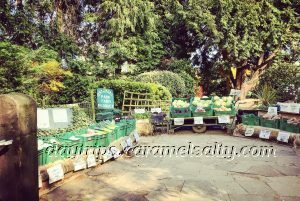 Osterley Farm Shop – closed Monday and Tuesday. Open from 08:00 to 17:00.